We welcome you to begin a healing process and reach your optimal health. 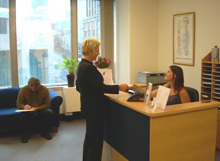 You can expect our office to be warm and comfortable as we work together to help you recover. This chic atmosphere welcomes you with subtle music playing and a friendly welcome from our caring team. Our office runs on time so we can get you back out the door to your busy day. When you’re ready, give us a call so we can schedule a time for you to visit us for your first appointment. When you first arrive, we’ll explain our processing procedure and begin by getting to know your health history. We’d like to understand what brought you in to see us and considering the full spectrum of your health will help us customise care to your needs. Dr. Nick Laurie (Chiropractor) will then perform a chiropractic examination, screening for pathologies and anomalies. He’ll check the state of your spinal health and overall health while looking for your subluxations. Many times, we’ll take X-rays. This visit usually lasts around 30 minutes. After examining your X-rays, Dr. Laurie will devise a plan specifically tailored to your needs. He’ll review all of his findings and answer any questions you may have. You’ll be given your first adjustment and provided with your chiropractic care plan. You can expect this visit to last around 20 minutes. When you’re here, we’ll explain how chiropractic care affects your life and health. Adjustments are very gentle and will not hurt, whether it be for a newborn or someone in their nineties! You don’t necessarily have to go to a gym to be fit for your entire life, but your body works better if you do. The same thing goes for chiropractic care. If you choose to visit a chiropractor, you will live a better life.